How do you teach kids to use the Google well? You give them a really creepy guy with a beard and long hair to search for online and then give the guy who has the best pile of information on him a bleutoot speaker. We discuss that, among other things like the rise of a WordPress botnet, another Scroogled ad but now against Android, and so much more on ATN #71: Best Stalker. Really, you should listen to this one. Control Structure, a podcast on The Nexus, with hosts Andrew and Chris, hosted John Gosling, a real famous person on Tuesday! John is a game developer and designer with Level Zero Games and he is working on his kickstarter game, Net Gain. During the show, John shares his inspiration, his programming prowess and more! It’s a great episode and hopefully just the first of many famous episodes. I have used Audacity to edit the podcasts on The-Nexus.tv since December 2011. When I built my new computer in October 2012, I was able to edit three times as much audio as before. My workflow is efficient as I can know how to make it in Audacity right now. I edited At The Nexus #59: Nothing Happens Intentionally last night entirely without Audacity and completely with REAPER. It took me four hours to experiment and actually get show and its associated fringe produced, but as with all new products, it takes a while to learn and the investments come back quickly. This workflow has it’s advantages. The Normalize-Compressor-Normalize scheme brings the volume down a bit, the compressor shifts the audio so quiet bits are louder and loud bits are softer, and the second normalize cleans the form up again. The noise removal before splitting the show and fringe allows both episodes to have a consistently removed noise level, likewise, the NCN scheme keeps the audio consistent across files too. The real processing step is truncating silence. On shows I think are really long, I am harsher on the silence, otherwise, I find -40 to be a reasonable threshold (oh, and it’s default). Saving this for last keeps the show markers in place, which as it turns out, is insanely important if you’re going to use them. I know my workflow in Audacity so well that it takes me maybe twenty minutes to produce a show and it’s fringe, but then another twenty minutes to actually render (see export to FLAC/MP3) them. 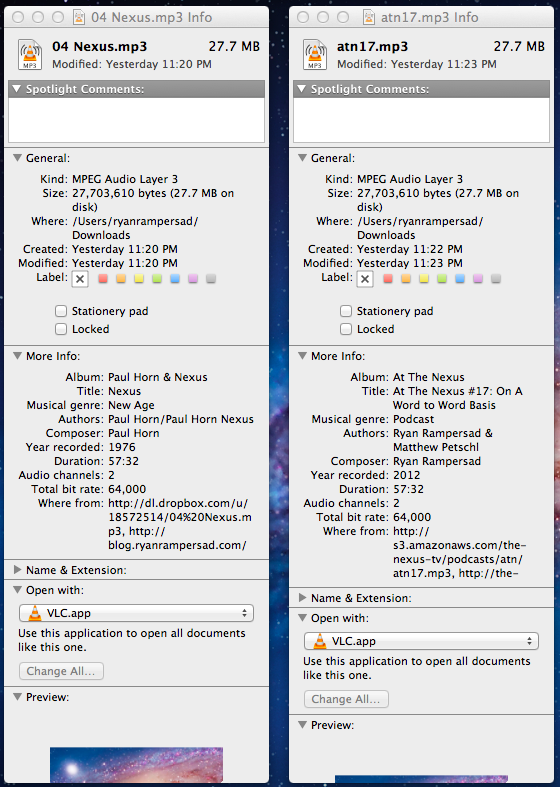 Audacity’s biggest short coming is that it offers no way to enqueue multiple types of export (two MP3s, two FLACs). I have to wait for each one individually and then start the next (if I remember, and if I’m even there) export. REAPER works differently. 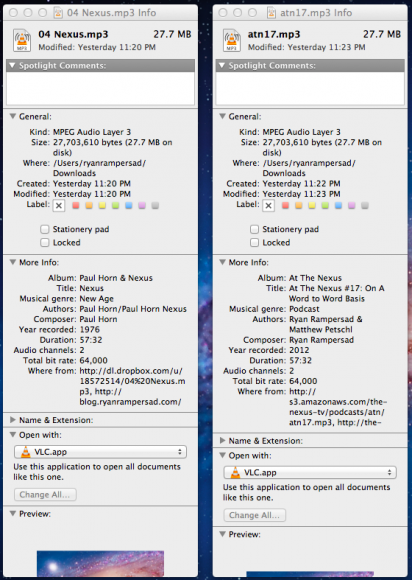 You never change audio when processing it (well, we’ll get to the nuances another time). Most processing effects happen in realtime. For instance, the noise removal tool allows me to find some noise, listen to it, build a profile, and then that’s it — I don’t have to process the entire show again right there. Audio is built on demand and I hear it when I need to. Likewise, when I run normalize or the compressor (which is a travesty of its own for another day), I just have to enable and then it’s done — there is no pre-processing and the original audio is completely intact. I made the mistakes of a beginner unfamiliar with his tools in episode 59. We’ll see if you can hear them. Next time, I’ll detail the steps I take in REAPER to produce the show and explain the finer points of setting settings without explanations. Here are the final hours of 2012. I would like to thank you for reading. This year, this blog changed, I hope, for the better. It’s been a lot of fun sharing links and posting code snippets. I hope I can keep up with it better next year. You can see my blog’s statistics brought to you beautifully by WordPress. Have a good one and watch out for cars. Oh, right. You can also checkout our New Year’s Nexus Special and end of the year episodes of The Universe and Eight Bit. Merry Christmas. I present two huge gifts to you: At The Nexus #55: Ebertz On The Line and Eight Bit #16: The Runescape Phase. These two episodes were fantastic and if you listen, your Christmas is surely going to be jolly. But if you think the giving stops there, allow me to present essentially three hours of The Fringe from At The Nexus and from Eight Bit. These fringes are epic. You can listen to this fantastic episode of Andrew’s sleeping habits — snoring, development and more. Control Structure #4 is out! P.S. it’s really good. Listen. Seriously. Usually I try to avoid blatantly posting our competitors all over our own sites, but this is a special exception. John Siracusa lead me to Journey and I really do appreciate that game among the few I played in the last ten years. This week John and the Incomparable group played and review Journey, sharing their feelings and thoughts of their journey through Journey. If you’ve played already, then you should listen and feel right at home listening to their experience as much of it will mesh with your experience in some way. If you haven’t played Journey, you can still grab a copy on PSN I believe, or you can get a special collector set at some retails and have physical momento of an epic-class game. Another amazing show from the gaming pair, Ian and Ian. This week, I am a guest on their show! I participate in their Lightning round and share my own review on Guild Wars 2. A really fantastic show full of epic laughter and jokes you will only get if you follow our other shows too. So try it, Eight Bit. And this week we had another great show. Matthew returned to his co-hosting role this week. We talked about the lingering iPhone 5 news from earlier in the week, how Google is the best — and worst company ever, why HTML5 is a mistake and more. Wow. We launched a new show. It’s fantastic. Ian Buck and Ian Decker nailed their inaugural episode. You have to listen to this show. On the first episode, Ian and Ian discussed their gaming upbringing, news about keyboards, Ubisoft’s absurd 95% piracy rate and their solution, 4K monitors and 4K PS4s, a special piece on the Steam community, a few gaming reviews and so much more. Did I mention this was a good show? And I don’t even play games. Sometimes, there’s an episode of At The Nexus. Other times, there’s this episode of At The Nexus. Robin Pillmann was an exceptional guest to join me this week covering the latest Amazon news: the barrage of new Kindles — Paperwhite, HD, 8.9” and more, and of course some last minute linkbait before Apple’s suspect iPhone event next week. So listen to that and more At The Nexus #41: Chew Toy Covered In Vomit. Despite some delierium, Matthew Petschl and I somehow managed to get a show put together. I feel like the Lightning was a little long, but overall, it was a great show with discussion on the Windows RTM, Nvidia’s expensive low-end graphics card, meteor watching apps for iOS and Android and so much more. We’ve had a fun weekend. On Saturday evening, I sat down with my father and we discussed his normal person impressions of Windows, Best Buy’s store closings, and lots more. It was a lot of fun having my dad in studio actually speaking this time. On Easter eve, Ray and Ryan Rampersad enter the basement and chat about Android’s ignorance of the normal, animal travesties, types of cheese, Target’s layout, Windows 8, Best Buy’s impending doom and possible solutions, brief covers of this week’s news and more! On Sunday evening, Matthew Petschl and I actually created a podcast covering everything from my phone review, to Facebook’s patents, to OS/2 Warp’s 25th anniversary. Matthew Petschl and Ryan Rampersad manage to throw a show together a show and talk about Wifigate, the Java-Mac virus, the words from the seer, the real review of Ryan’s new phone, more lawsuits galore, Yahoo versus Facebook, the OS/2 celebration and so much more! Two great podcasts ready for your listening pleasure. At The Nexus is a great podcast. When I setup the meta-data for the podcast file each week, I adhere to certain convents. The title is compromised of the show name, episode number and the show title. Along with that, I set the genre, year and track number. Well, listener Ian Buck found an intriguing irregularity. He downloaded the latest episode onto his computer and he was greeted with whoever Paul Horn is. I discovered the name Paul Horn because I downloaded the podcast to listen to at home; windows claims that the album is “Paul Horn & Nexus” the album artist is “Paul Horn” the contributing artists for this track are “Paul Horn; Paul Horn Nexus” the track number is 4, the year it was released is 1976, and the genre is New Age, and the publisher is Wounded Bird Records. That, as you can imagine, is unintended. The better illustration is a screenshot of the real ID3-tag meta-data and the strange meta-data Ian’s file somehow obtained. The album art stayed the same, but all the tags changed. Before we began the formal Nexus, our mp3 audio files would randomly get some album art assigned too, but it was VLC causing it, and it was not meta-data affecting. This is different.